Times are tough for Sony. The once-venerated electronics manufacturer is struggling in the tablet, smartphone, and digital music-player markets, so I felt much trepidation when I opened the box of the Xperia Tablet Z, Sony's new $500, 10-inch Android tablet. But I came away pleasantly surprised. This is an idiosyncratic device, to be sure, but it's got a whole lot going for it. At 495 grams, the Xperia Tablet Z is so light, it seems more like something you'd find atop a coffee table at a furniture store than a fully functional tablet. I've never felt comfortable carrying a full-sized iPad in one hand due to its weight (652 grams), but not once did I worry about dropping Sony's tablet. At 0.27-inch thick, the Xperia Tablet Z is also thinner than the 0.37-inch iPad. But because it sports boxy edges (as opposed to the iPad's curved lines), it doesn't feel thinner than an iPad--but it is much easier to hold onto. In fact, this is the first large tablet I've held that feels more like a magazine than a piece of technology. This isn't to say the Xperia Tablet Z feels cheap--far from it. From the front, it's a black glass slab resembling the monolith from "2001: A Space Odyssey," but for the Sony logo next to the top left corner of the screen. (Bad form, Sony. And the logo placement is even worse when staring at the tablet sideways or upside-down.) The sides are featureless black, but for a silver on/off button, and the back is matte black. It's pretty, but picks up fingerprints in a hurry. One of the Tablet Z's most interesting selling points is that it's waterproof. You can't take it scuba diving, but you can bring it in the bathtub with you. This feat is managed by the placement of removable port covers over the tablet's Micro-USB port (also used for charging) and Micro-SD slot. As someone who bites his nails but doesn't routinely find himself wanting to use a tablet where it's wet, I found this feature annoying--it was a bit of a struggle for me to get those ports open. That said, if you're someone who does fancy a tablet surfing session while taking a bath but don't want to perform the Bezos Maneuver and stick your device in a Ziploc bag, have I got the tablet for you. Sony's display isn't as high-resolution as those found in Apple's Retina iPad or the Google Nexus 10. Its 1920-by-1200-pixel screen is big enough to display 1080p HD movies at full resolution, and text is crisp (although not quite Retina crisp) at a resolution of 224 pixels per inch. The Xperia Tablet Z's internals are bit more state-of-the-art. It's got a 1.5GHz Qualcomm Snapdragon S4 quad-core processor and the Adreno 320 GPU. Its front-facing camera is only 2.2 megapixels, but the rear camera weighs in at 8 megapixels. We're not yet at the point where you'd want to use any tablet as your primary camera, but in a pinch the Xperia Tablet Z's will do the job. The Xperia Tablet Z runs a modified version of Android 4.1, and while it's not the stock Android experience that I'm most comfortable with, it's pretty nice. There's a nifty app dock at the top of the screen, where you can place commonly used apps, as well as a shortcut to the apps list. The entire U.I. and app experience felt responsive, though as with most Android devices I've tried, performance can be spotty--some apps scroll smoothly while others still experience lag and judder. 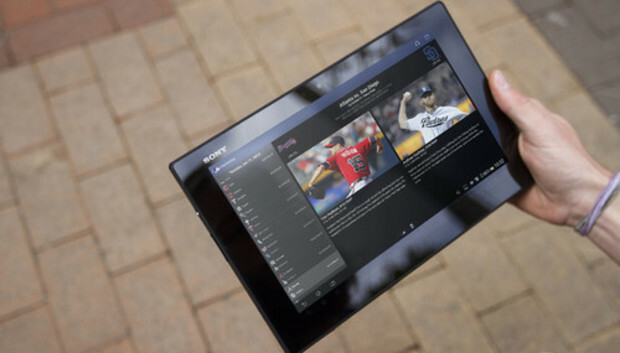 Sony has piled entertainment-focused apps into the Xperia Tablet Z. There's a connection to PlayStation Mobile, Sony's Video Unlimited store, and the Sony Reader ebook store. I suppose there are some people on Earth who live a Sony lifestyle and own only Sony products, but to me it's just corporate synergy. Fortunately, all the usual Google Play apps are there as well, so if you'd prefer to rent movies from Google, you can go right ahead. The Xperia Tablet Z comes with an infrared blaster on its top edge, and the included Remote Control app lets you program it. Building an infrared remote into a tablet is a great idea for people who use their tablets in the living room (I know I do), but this software isn't really up to the job. Of course, all device settings default to remote codes for Sony-built devices, but you can control just about any device you've got in your living room. Unfortunately, when I tried to add my LG HDTV, I was prompted with a list of more than 40 device profiles to try, one at a time--and had to wait after every selection for the next profile to be loaded. There's no way to enter in your device's model number, and apparently no way to chain different device events together a la Logitech's Harmony remote. It's a shame--this is a fun idea let down in implementation. I was also baffled by the Xperia Tablet Z's setup procedure when I first turned on the tablet. The initial startup process tried (and failed) to connect to the Internet before asking me to connect to my local Wi-Fi network, which seems like a pretty basic mistake. Once I opened the settings manually and connected to my Wi-Fi network, the rest of the setup process--including a request to connect to local Wi-Fi--proceeded apace. Though the included software has some rough edges (which can mostly be ignored or hidden), the Sony Xperia Tablet Z hardware is remarkably polished. It's dramatically lighter than the Nexus 10 and the iPad, and though its screen can't measure up to those devices, it's still pretty good. The watertight port covers vexed me, but anyone who has dreamed of using his tablet in the bathtub without fear of a catastrophe won't care about them one bit. Is the Sony Xperia Tablet Z the best 10-inch tablet on the market today? Not with the Nexus 10 and the iPad 4 roaming the land. But in the sea, Xperia Tablet Z reigns supreme.